Rong Hua Bak Kut Teh - Rong Hua Bak Kut Teh only serves authentic spices and take pride in our food quality. The originating roots of "Rong Hua Bak Kut Teh" can be traced back all the way to the 1920s, when our founding grandfather, Mr Chua Ah Hua migrated to Singapore or Nanyang in search of a better life and fortune for his family. When Mr Chua arrived in Singapore, Bak Kut Teh was already being served by the Teochew's around Char Jung Tao (Clarke Quay). In the early days, Ah Hua started work as a coolie (manual labourer) and he discovered that by consuming his favorite Bak Kut Teh soup regularly in the morning, he found the energy boost he needed for his back breaking work of unloading sacks of rice off the sampans. His interest in this dish soon led him to find pulpilage as a kitchen apprentice at a well known Teo Chew Bak Kut Teh stall owned by his village elder, Uncle Rong. As the years gone by, the young Ah Hua grew in culinary skills and experience under the discipleship of Uncle Rong. 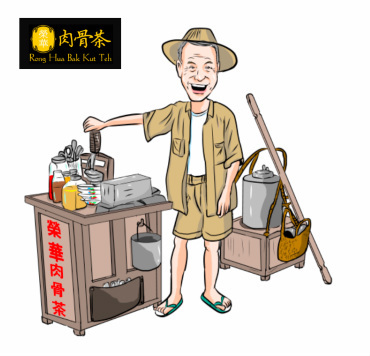 What truly impressed Uncle Rong was the hard work and dedication displayed by Ah Hua in his personal goal to perfect the culinary art of Bak Kut Teh. In Uncle Rong's own words, the highest level of culinary success is when Bak Kut Teh becomes a dish prepared "using your own heart and soul". Before the late Uncle Rong passed away, he named Ah Hua his personal successor and together with the younger Ah Hua, they went on to develop their very own unique blend of popular pork ribs' soup recipe, which eventually went on to be known as Rong Hua Bak Kut Teh. ​Copyright © Culinary Holdings Pte Ltd. All rights reserved.